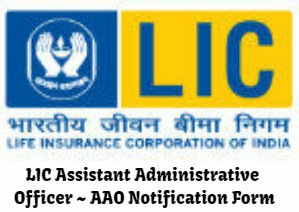 The Life Insurance Corporation of India (LICI), Online Registration in response to Advertisement in respect of the Recruitment the Post of Assistant Administrative Officer (Generalist) (AAOG) is in progress from 02nd of March 2019 with the Deadline closing on 22nd March 2019. The Life Insurance Corporation of India (LICI), Last date for Online Registration & Online Payment of Application Fee/Intimation Charges is 22/03/2019 through the website. Eligible and interesting applicants may apply for the online application form through the website from 02.03.2019 to 22.03.2019. General Candidates should be Minimum 21 Years but must not exceed 30 Years of Age (i.e., he / she must have been born neither earlier than 02.12.1988 nor later than 01.12.1999). Relaxations in Upper Age Limits for Candidates seeking the same. He / She must have Bachelor / Master’s Degree from a recognized Indian University/ Institution. Pre-Recruitment Medical Examination (aimed at ensuring Physical Fitness of the Finally Selected Candidates). In case of clarifications, assistance, the candidates are encouraged to log in to Life Insurance Corporation of India Website www.licindia.in/.